Just a quick reminder that there's still plenty of good markets to visit this weekend with heaps of good food. Whip up a batch of soup or a nice salad. Really, the possibilities are endless, so why not give it a go? Good luck! A sweet little market not far from Tokyo Big Sight in the center of a bunch of high rises. Head on over to rock it with the veg! 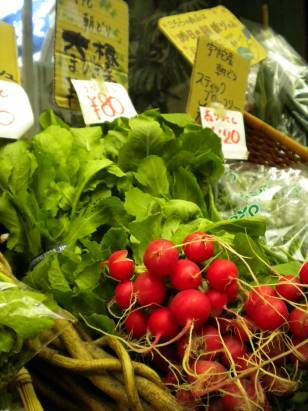 I went to the UN farmers' market on Sunday in Shibuya and it was fantastic! Anyone living in Tokyo who hasn't been to this fun-fare is missing out on so much. It was busy with sellers of everything from natto to sake, much of it organic. I also went to check out the Nippori Marche which is much smaller and cozy, and more opportunities to talk to the people who are selling goods from all over Japan. Thanks Popcorn for introducing these events!